PrintSafe Ltd is a respected supplier of industrial coding and marking equipment. We offer a range of coding, marking and labelling systems for high-speed printing of date codes, batch codes, bar codes and other variable data – a critical step in the production and packaging process for food, drink, pharmaceutical, healthcare and industrial companies. PrintSafe serves customers across the UK and Ireland. We offer consultancy and support, installation and configuration services, as well as spares and consumables. The PrintSafe philosophy is to keep things focused and simple: we look at customers’ needs, identify the best solution at the appropriate price, and then continue to offer after-sales support in a swift and no-nonsense way. PrintSafe is the exclusive UK and Ireland distributor for KBA-Metronic GmbH, an established manufacturer of high quality coding and marking machines. The udaFORMAXX product range is ideal for offline sleeve and carton coding. These standalone systems can be used to apply date codes, batch codes and labels to sleeves, bags, watch strap bands, cartons, and other flat form materials. Up to 600 items can be printed or labelled per minute, and the machine adjusts easily to handle different types and sizes of packaging. These low maintenance and easy to operate machines can be used with inkjet, thermal inkjet, thermal transfer, hot foil or laser printers. They can also be fitted with a label applicator for applying promotional and other labels. Please visit our website for full details. 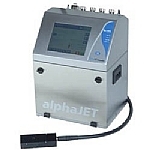 The alphaJET mondo is a simple to operate, simple to clean, and easy to use small character inkjet printer for printing date codes and other data on a range of packaging types. The compact design of this entry-level inkjet makes it simple to integrate into your production line. An easy-to-use colour touch screen means that training operators is a quick and painless process. The “no pour” ink and solvent system makes ink changeover a breeze. The solvent recovery system eliminates nasty odours and keeps consumption to a minimum. Please visit our website for more details. 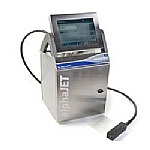 The alphaJET tempo is a high speed industrial inkjet printer that prints at up to 11m/second (3,500 characters per second). It is IP65 rated for washdown or dusty production environments. 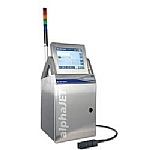 The alphaJET tempo is a high-quality machine that can be relied on for printing clear, crisp codes and marks. It it is the ideal printer for cabling applications. The alphaJET tempo can be used with a wide range of black, pigmented and specialist inks. Please visit our website for more details. The alphaJET pico is an inkjet printer that is built with a special aim: to print very small fonts while maintaining excellent readability. This product is ideal for printing significant amounts of text in narrow and small spaces. Uniform droplet formation gives you an exceptionally clear code. It is ideal for printing 2D data matrix and dot codes on restricted print areas. The alphaJET pico comes with all of the other features standard across the alphaJET product line: IP 65 rating, simple design, easy-to-use touchscreen control, solvent recovery system. Please visit our website for more details. Hot foil printing is an effective way of over printing changeable information such as barcodes, batch numbers and use by dates. Our range of hpdSYSTEM machines allow you to print in various orientations and as the print dries instantly you don’t need to allow for drying time. We offer three models of hot foil printer; hpdSYSTEM vario, hpdSYSTEM nano, hpdSYSTEM mango. The vario is a user-friendly yet feature rich unit that has been designed for individual product coding. If space is limited then the nano miniature unit is an excellent choice and is easily integrated with your existing packaging and labelling equipment. The mango has been designed for printing on large print areas. Thermal printing is fantastic for high quality, variable data printing offering a print resolution of 300dpi. Thermal printing technology works by energizing and subsequently heating elements within the print head. It’s this action that diffuses the colour pigments from the ribbon and enables transference to the print material. We offer a choice of three different models of thermal transfer printers to suit the majority of applications. The ttPRINT inline offers a choice of print widths, as does the ttPRINT multiline, which also allows for varying print lengths giving a print area of up to 128 x 630mm. The ttPRINT xs is a compact unit with a print area of 53 x 40mm. The betaJET verso thermal inkjet printer is a zero-maintenance option for high-speed printing on both porous and non-porous surfaces. It offers fast, consistent printing with excellent code quality. As with the alphaJET continuous inkjet range, the betaJET verso thermal inkjet has an easy to use touchscreen interface and is built to withstand demanding production environments. Please visit our website for more details. If you are mindful of lessening your company’s impact on the environment then the non requirement of consumables makes laser systems extremely appealing and has the subsequent advantage of being a cost-effective solution. PrintSafe are pleased to offer five different laser systems from the iCON LaserSYSTEM that is designed for small character coding and the K-100 CO2 LaserSYSTEM, which provides consistently high markings, to the F-9000 Fibre-LaserSYSTEM and D-5000 Nd-YAG-LaserSYSTEM, which both print directly to metal or plastic materials. For full details of each model please see our website. If you require an offline coding system that will allow you to accommodate seasonal or one-off fluctuations in capacity then speak to PrintSafe. Our equipment hire service means you don’t have to invest in costly equipment but can still meet the demands of increased throughput when needed. Our short-term rentals are also a great way to realise potential cost savings before committing to purchase our systems outright. You can hire date coding and labelling systems with a choice of hot foil, ink jet or tt printers. Our after-sales service allows you to purchase a complete range of official KBA-Metronic consumables. Our stock of standard continuous ink jet inks is complemented by a selection of specialist inks including thermochromic, pigmented, fuel resistant and food grade inks. For hot foil systems we stock a comprehensive range of hot foils in various colours, lengths, widths and finishes, and hot foil letter types and blocks, as well as ribbons for thermal transfer systems. We are also stockists of official KBA-Metronic replacement parts to ensure you’re system continues to provide maximum efficiency. Please contact us or see our website for more information. PrintSafe Ltd’s high quality products are all backed by dedicated support teams, whether you need the services of our UK-wide team of technical engineers or need a spare part quickly, we’re there to assist. We offer our customers free telephone support Monday to Friday, 9am-5pm, and our repairs service is available either on site, or from our workshop. If your system cannot be fixed quickly then you can take advantage of our hire service ensuring your business carries on as normal. When purchasing a system from us you can also take up a maintenance agreement that provides scheduled maintenance ensuring your system is always in tip top condition, and depending on which level of agreement you opt for, it can also entitle you to discounts on spares. If you've any questions about PrintSafe (KBA Metronic UK) Ltd products or services feel free to ask them here. KBA-Metronic High quality, German-engineered, coding and marking systems.